In 2012, the Internet research firm, comScore, presented data stating that mobile users would surpass desktop users by 2014. Well, they were correct! The world witnessed mobile Internet usage takeover desktop as early as February 2014 according to Nielson. It has almost been a full year since this data was published. Although the mobile revolution wasn’t a major surprise since comScore shared their predictions over two years ago, the majority of businesses (small, medium, and large) have not yet adjusted and modernized their web presence. Hopefully your local business was one of the hundreds of thousands that have made the switch to a mobile friendly web presence because the mobile future is here. Your mobile web presence is not only being judged by Google, but by your customers as well who are seeking a seamless experience on their preferred devices. Because so many businesses are lagging behind, those that adapt now have a leg up on their competition. Here are a few stats that will either reaffirm your decision to stay progressive or light a fire under you to make adjustments! 1. Mobile friendly party booking matters for FEC’s. When your entertainment center uses mobile friendly event booking, it wins! According to Party Center Software, 50% of parties booked using their mobile friendly party booking software in 2014 came from a mobile device. Your customers habbits are changing dramatically. Most of us only sit in front of a computer if we’re at work. Your customers are booking parties from the comfort of their couch during commercial breaks for The Walking Dead and Shark Tank. 2. 94% of smartphone users search for location info. According to the Mobile Playbook by Google, almost everyone with a smartphone uses it to look for local specific information. That means that mobile searchers are looking for “fun things to do in your city, your state” and “birthday parties in your city, your state.” When your customers visit your website, you should be concerned with their experience. Does your site load quickly? Is it difficult to read or navigate? 3. 40% of mobile active consumers have turned to a competitor’s site after a bad mobile experience. Your customers care about their mobile experience on your website. They care about it so much, that 40% will simply give up and go to a competitor’s website if their mobile experience with your brand isn’t up to par. A mobile website should be your number one priority to meet the need of Internet searchers and prevent them from abandoning your site for your competitor’s. 4. Businesses that use Internet marketing will spend more money on mobile than desktop in 2015. By 2018, eMarketer suspects that 76.6% of US search engine (SEO and paid advertising) will go to mobile. For the first time ever, mobile will overtake desktop in 2015 when it comes to businesses investing in being found online. What’s causing this dramatic shift? Mobile users are quickly changing how they use the Internet. Users will begin to search the Internet primarily through their mobile devices than their laptop or desktop. 5. Smartphone owners ages 18-44 are glued to their smartphone. Why should you adopt a mobile first mindset? Chances are that your target families have their phones by their side almost all the time! Do you know where your smart phone is right now? 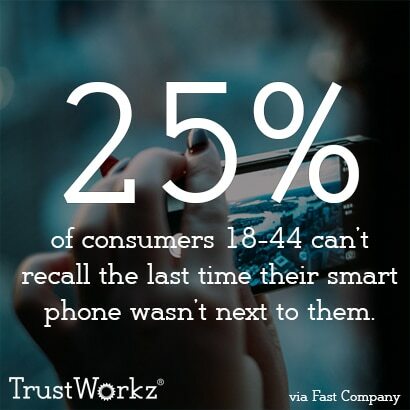 25% of smartphone users between 18 and 44 say they can’t remember the last time their smartphone wasn’t next to them. If that percentage isn’t eye opening enough, check this out! 79% of smartphone owners keep it by their side for all but 2 hours of their day. 6. 74% of adults smartphone owners use their mobile device to find directions and other location specific information. Smartphone users are always on the go. As of January 2014, almost 3/4 smartphone owners want to find location specific information. As mobile continues to gain dominance, it will become increasingly more important for businesses to monitor and control their local citations (the yellow pages of the Internet.) Ensuring that all of your location data is correct will help your business provide your customers with accurate information on how to find you. 7. 100% of mobile friendly websites will be highlighted in Google searches performed on a mobile device. In November 2014, Google rolled out a visual update to their search results. Websites that are now mobile friendly will be highlighted with a “Mobile-Friendly” tag next to their listing in searches performed on a mobile device. The visual itself gives mobile friendly businesses an advantage over businesses lacking a mobile solution. Scan your website to see if it passes Google’s mobile friendly test. 8. Consumers are using their smartphones everywhere… Not just on-the-go. 9. Search engines are a powerful driver local businesses. Not only are consumers using search engines like Google to find local businesses, but they’re using search engines once they get to the store as well. According to Google, 42% of in-store consumers are researching your brand while they’re in your store. 64% of these consumers are using search engines to find what they’re looking for regarding your business or services. This makes search engine and mobile optimization extremely important for local businesses. 10. 4 in 5 consumers conduct local searches on search engines. 56% all of searches have local intent. Consumers are actively looking for local information, and they’re overwhelmingly choosing their smartphones as the way to find it. As a business owner, you need to make sure that people can find your business online. Additionally, you need to make sure that it’s easy for your customers to use your website on their smartphones. Mobile optimization and search engine optimization are absolutely essential. If you have questions about whether your website is mobile friendly or not, request a free website analysis today and start 2015 on the path to online success!